Known for their remarkable top speed, luxury and reliability, Mercedes Benz has become a household name for anyone wanting a touch of class. 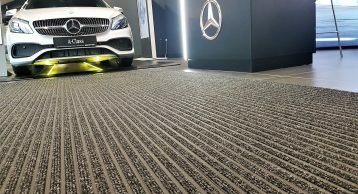 The car manufacturer is part of the Mercedes Retail group who are the largest Mercedes retailers in the UK with an impressive array of cars/vans to choose from.Find out how installing Entrance Matting is leaving a lasting impression on all the visitors and maintaining the internal aesthetics. The manufacturer has its network in 19 locations just in London with more around the country. They are spread across four division: New car, used car, Vans and Smart, customers can be sure of the very best service and choice. 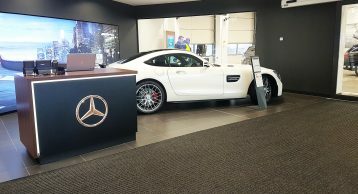 Mercedes Epsom is one of their flagship showrooms displaying the finest collection of cars from the jaw-dropping Mercedes SLS to the family friendly C Class. Selling these high value cars starts with the quality of service which starts with a showroom that wows. 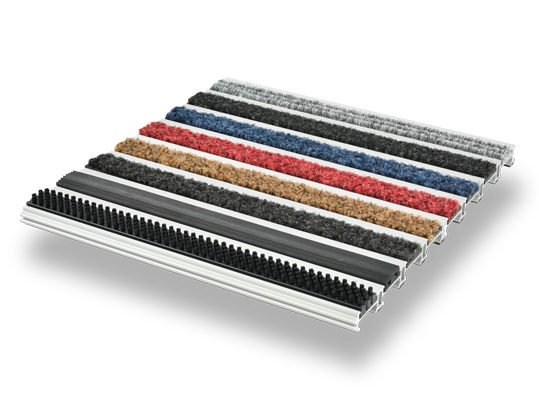 Having Entrance Matting to maintain the wow factor is crucial in reducing the amount of dirt that enters spoiling the internal surroundings. 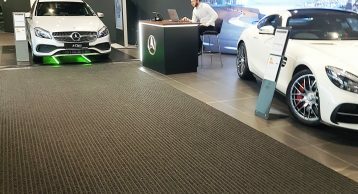 We could not be prouder to collaborate with Mercedes in being specified our INTRAform Entrance Matting to keep the ingress of dirt and moisture out of the building therefore retaining the aesthetic interior. Combine this with the stunning black adonisation of the profiles and a stealthy look is achieved. In keeping with the aesthetic of the showroom, the matting is at home with all the super cars. For the insert, 443 Anthracite Polypropylene fibre was selected. This is suitable for all internal high traffic entrances and can still have excellent appearance even under heavy traffic. 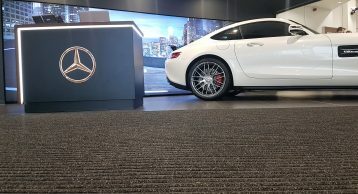 Occupying a prime position in every building our Entrance Matting is a key part that forms a unique first impression for every visitor. Our Entrance Matting truly enhances the building by design and helps give the clients a lasting impression. A heavy duty aluminium plank system, offering excellent performance and longevity in high traffic areas and versatile installation to all entrance designs.